Recently I read a post on India Flint’s blog (prophet-of-bloom.blogspot.com), in which India suggested using her method for dyeing with frozen flowers as a way of extracting colour from the leaves of indigo-bearing plants. So I decided to try this method with the last few remaining woad leaves in my dye garden. The leaves must be frozen as soon as they have been collected and they must be completely frozen before they are used, so they should be left in the freezer for as long as this takes. They can also be left in the freezer for a longer period, if you don’t want to use them immediately. I managed to collect just about enough leaves for a small trial dye bath and as soon as I had harvested them, I put them into a sealed plastic bag and left them in the freezer for about 24 hours. I then removed the leaves from the freezer and squeezed the bag to crush them before removing them from the bag. I then immersed the leaves in a bowl of lukewarm water. Out of interest I checked the pH of the dye liquid and it was pH7 (neutral). I added some silk and wool fibres, squeezed them with the leaves for a few minutes and then left them to soak for about half an hour. After this time the fibres looked blue. I then left the samples to soak for several more hours, after which they had become a grey/blue. I removed this first set of fibres and added soda ash to the dye bath to make it alkaline (about pH9). I added a wool skein to this alkaline liquid and left it to soak for several hours. This sample became tan/pink. The results can be seen in the photos below. (Note: The actual blue colours are rather greyer in tone than they appear in the photo.) The blue/grey colours are shades that are sometimes obtained from an almost exhausted woad vat and are also similar to those I often achieve from frozen purple flowers, such as pansies, using the same freezing and dyeing method. However, I was able to harvest only a few leaves for this experiment, so I intend to try it again next year earlier in the growing season and see whether a higher percentage of younger leaves gives different results. I will also try removing the fibres as soon as they have become a reasonable blue, rather than leaving them in the dye bath for a longer period, as it seems possible that prolonged soaking caused the blue colour to become greyer in tone. The pink/tan colour is similar to the shades obtained from woad leaves if they are simmered to make a dye bath. 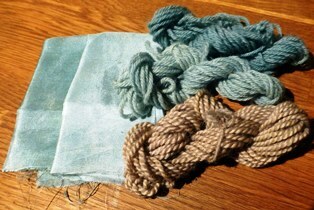 Although this method may not necessarily produce true indigo blues, it is certainly a useful way of using woad leaves and I am grateful to India for suggesting it. However, without experimenting further and conducting fastness tests, I cannot be sure that the colours achieved from woad leaves by this method would be as fast as those achieved by the more conventional methods.